Too many people are seemingly addicted to texting while driving—a bad idea under any circumstances. But maybe all that’s needed to break that addiction is a bit of tough love: a new, free Blackberry smart phone that adamantly refuses to receive or send text messages while its owner is behind the wheel, and politely intervenes when a tempter tries to get through. That is the idea behind ZoomSafer, a new app for Blackberry smart phones from a company of the same name, and its maker’s just-launched marketing partnership with Wirefly, a leading online purveyor of cell phones and service contracts for the major wireless carriers. Starting this week, visitors to ZoomSafer.com can click on a link that takes them to a co-branded Wirefly website offering free Blackberry smart phones—and some low-priced models--connected to AT&T, Verizon Wireless, Sprint PCS or T-Mobile service. And, upon receiving the new phone, the customer will be expected to download the ZoomSafer software free from the ZoomSafer website, where anyone who already has a Blackberry also can get it at no charge, until January 7, 2010. The way ZoomSafer works is simple: Once installed on the Blackberry, the app is automatically activated when the phone’s GPS sensor detects that the device is moving at a speed considered indicative of driving. It then takes control of the phone, locking the keypad to prevent texting or hand dialing, and suppressing inbound text messages and e-mail alerts. Those “land quietly in the device” to eliminate temptations to look at the phone’s screen, explains ZoomSafer co-founder Matt Howard. In addition, the software can be set to block all inbound voice calls or none, or to allow only certain inbound calls—from a preset list of 20 “priority contacts”—to ring through. All allowed inbound calls are announced with a “custom voice ringtone,” while intercepted calls are diverted to voice mail. Because some of those barred incoming texts, alerts or calls may be important, the software also sends their dispatchers auto-reply messages explaining that the phone’s owner is driving but will get back to them at the next stop. 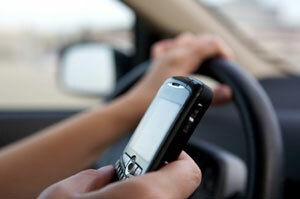 Sometimes, of course, it’s critical to be able to make an outgoing call while driving. Or, the phone’s owner may be only riding in a moving vehicle. So there's one-button access to voice-activated dialing and 911, as well as an opt-out feature for passengers. ZoomSafer can also share the driver’s status via Facebook or Twitter. A ZoomSafer app for Windows Mobile phones also will debut commercially on January 7, and a Google Android version is expected in the first quarter of next year, when the company expects to announce at least one insurance company partner that will offer discounts on users’ auto policies, Howard says. 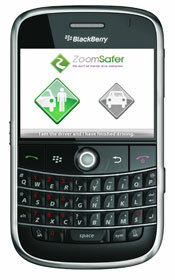 However, ZoomSafer is not the only software aiming to prevent driver distraction by inhibiting cell phone use. Nor is it the only one to be endorsed by an insurance company. DriveAssist from Aegis Mobility, expected to be available next summer, has already gained backing from Nationwide Mutual Insurance Co., which has promised to offer its users a five percent discount on their auto coverage. Another similar app is cellcontrol from obdEdge. Available commercially for Blackberry phones since October, it works wirelessly with a portable hardware device that connects to the car’s on-board diagnostic (OBD) computer—instead of using the phone’s GPS sensor—and is activated when the car is moving as slowly as 1 mph. Cellcontrol is more expensive than ZoomSafer, at $59.95 for the hardware, plus a $24.95 fee per phone installation for the software, plus monthly service fees of $8.95 for the first phone and $3.95 for additional phones. But it’s also somewhat more sophisticated. For example, up to six phones can be linked to one hardware device in a family plan, and each phone can have its own unique set of rules—including specific days and times when a phone’s distracting functions should be disabled or not, in a specific vehicle or in multiple vehicles. There is no limit to the number of phones that can be controlled by the cellcontrol hardware within the vehicle, as long as they have the software linked to a plan, notes Leigh Gilly, director of business development at obdEdge. And there is no passenger mode override. Moreover, an e-mail alert is sent to the family plan’s administrator as soon as the hardware is removed from a vehicle. So, he suggests, groups of parents with their own family cellcontrol accounts could band together to mutually restrict their children’s friends’ phones in their cars—thus also preventing the dangerous sharing of phones while driving. Versions of the cellcontrol software for Android and Palm phones are expected to be available before the end of this year, and Windows Mobile, Symbian and Motorola iDEN versions are expected by January. I really like the feature, but someone would truly need to have strong will power. Especially because it has a feature to turn it off. Great idea, but the user has to be 100% willing to do this on their own accord! Not a bad idea from Blackberry, this should be used on all cell phones. There are so many people texting while driving, it’s not even funny. I really don’t understand why people text when with a short few clicks they can talk on the cell phone. Talking and using the cell phone is a lot safer then texting.